No one has ever complained that the age of sail naval battle genre has been over-saturated, so I was looking forward to spending some time with Abandon Ship, now in early access. Snagging some mechanics from FTL, a Kraken or two from Pirates of Caribbean and iconography from 19th-century maps, Abandon Ship seems to be sailing along well towards a full release. Anyone expecting a full-featured and historically authentic naval warfare simulator should just jump overboard right now. Although there is a hearty nod towards the weapons and tactics of real naval battles the inclusion of fanciful sea monsters docks Abandon Ship in the Pirate/Fantasy bay. There is a story of sorts and it sets in motion the act of exploring a fog of war-clouded overworld map -- nicely presented in the form of an animated naval chart but rather empty of incident --in search of encounters. The majority of these encounters are turn-based, ship-to-ship battles. You assign your small, fledgling crew to various stations on your ship -- someone at the wheel, someone to heal, someone to man the cannons, etc -- and the battles begin. While the crew can handle most jobs, they have ability-boosting specialties. Deck fires must be extinguished, crew members must be bandaged and eventually, the enemy ship is sunk. Or, not. After the battle gold can be spent on upgrades to weapons and new, more lethal technology purchased. The battles are usually quick and while there is a range of tactical options and a treasure chest of weapons and upgrades to unlock, there isn't a huge variety in the encounters. Sailing around the overworld map in search of the requisite mission markers--which unlock the next area--is fast but not necessarily fun. The tiny crew members are engagingly animated and controlling them in battle while making all sorts of tactical decisions gives the encounters a white-knuckle feel of impending failure. Graphically, Abandon Ship looks decent enough but hardly bleeding edge. 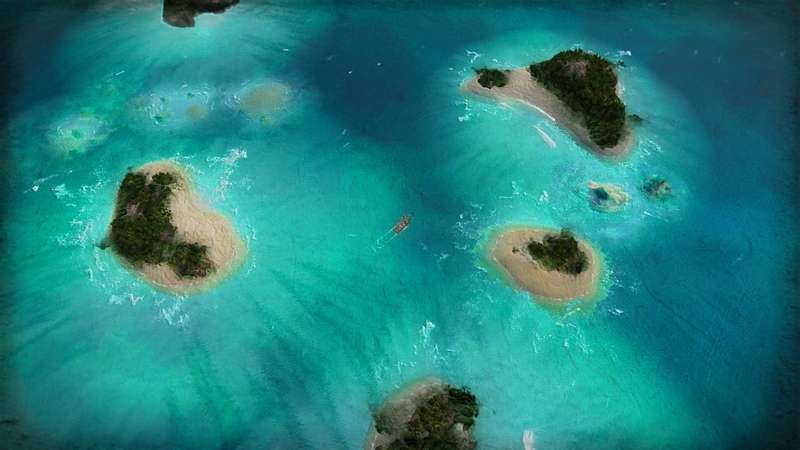 For a game so thoroughly at sea, the ocean is one of the visually least accomplished parts of the experience, although many of the game's weather effects are convincing. Faring much better is the game's sound design, which lends a nice, visceral punch to each round of cannon fire, or shot tearing through the sails. What's there of Abandon Ship is polished enough and a decent amount of fun to play, but it's clear there is much more content to come, from a fleshed out campaign to wider variety of ships and mission types. Naval battle games are always a welcome diversion and while Abandon Ship sometimes feels like FTL on the ocean, the game's turn-based combat and nautical setting provide a strong foundation for what's to come.